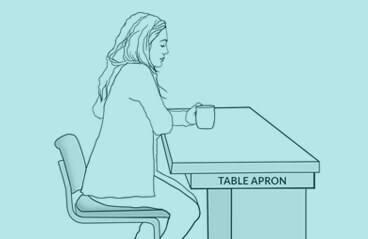 What is a countertop apron? While you may associate an apron as a garment worn in the kitchen, a countertop apron is an apron that is found under and around the table top which is usually about 2-6 inches thick. Table aprons add to the design of the table or counter. While aprons add design appeal; in reality — they can present a problem when selecting the proper height stool. 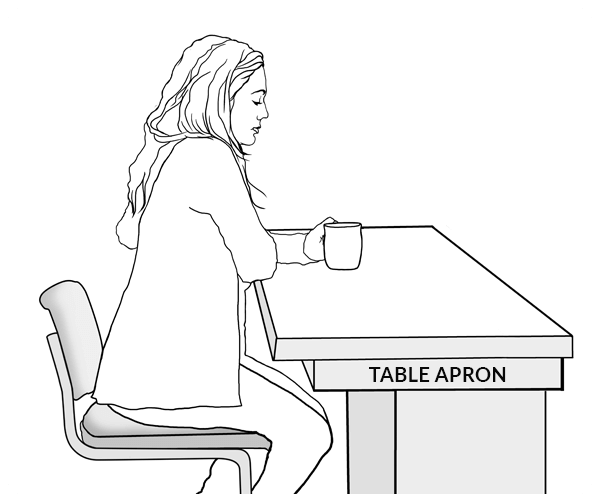 Below, is a visual of no table apron (left) and with a table apron (right). With no apron, you will have room for your legs. With a table apron, leg space is limited. Notice how the apron (right) now limits your leg space. Naturally, you would think you need a lower stool height, but there’s more to it. While a lower height gives you more leg room, you’ll now be sitting much lower at your counter, causing you to no longer see eye-to-eye with someone across from you. Let’s say we add an apron about 4 inches thick to a standard 36 inch high counter. With the apron, this now leaves you with a 32 inch counter from the apron to the floor. 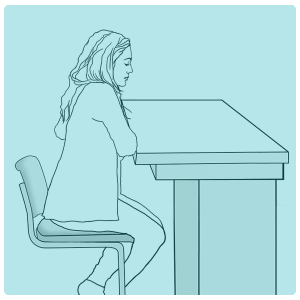 The most comfortable distance between the counter and the seat is 10-12 inches. Let’s now subtract 10 inches from 32 which is 22. 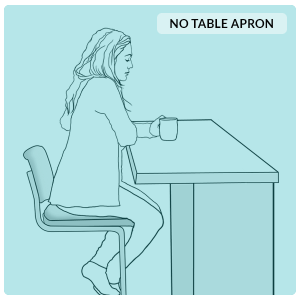 This would be the optimal seat height without an apron, however, you’re now going to be sitting too low, to where your arms might reach the top of the counter or they may not. Before you build your island (or have someone build it for you), make sure your apron is no thicker than 2-3 inches, as anything thicker can cause these problems listed above. However, if you’re already in this situation and aren’t sure which height is best for you, simply ask us and we’ll be glad to advise you. We’re experts in our field.